Today I read about a company based here in San Diego (and Detroit) which is developing 1-3 cylinder engines to work in hybrid vehicles and military or commercial applications (like Auxiliary Power Units, compressors, generators, etc). Earlier in the 20th century these engines were common in aircraft and large marine vessels, but have disappeared like many other alternative powerplants. 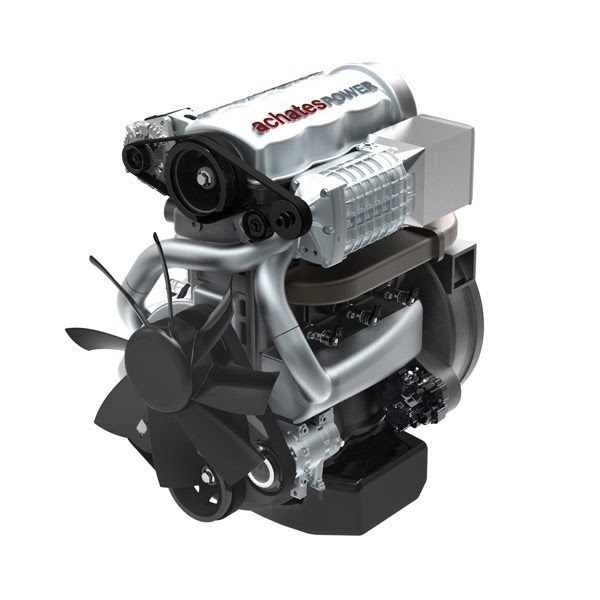 Achates design improvements are in multiple areas -- 2 stroke (no valves), compression ignition (no spark plugs; able to run on many different fuels) and boxer pistons (no cylinder head). Both supercharging and turbocharging are used to maximize efficiency, and the engine already exceeds global standards for low emissions. I can see some of you scratching your heads -- is this like a mechanical watch with no escapement? No, the combustion chamber is "in the middle" of a long cylinder where two pistons meet (there is a crankshaft at either end). Fuel is sprayed in from the sides of the cylinder. Here's a video that shows a lot more about the engine's operation. Is there still some life in the internal combustion engine? I am afraid so - having had hybrids, full electric and investigated hydrogen ... I think we still need vehicles that are affordable and fueled through conventional carbon fuels. There's not enough charging capacity in the world to convert everyone to clean energy in the next few decades (my opinion).